Oh! Oh, my gosh. I have been crying – bawling, really – for half an hour. Oh, my good gosh! I opened my present from Mikelle and it just tore my heart right out and made me crazy, ugly-cry and sob until I got myself back together and now I’m just totally amazed! What a thoughtful, wonderful gift. Merry Christmas, Mom! First of all I just want to tell you thank you for everything you do! You have been so much help since Oaklyn was born! You are such an amazing Mom and Grandma! Easton adores you! 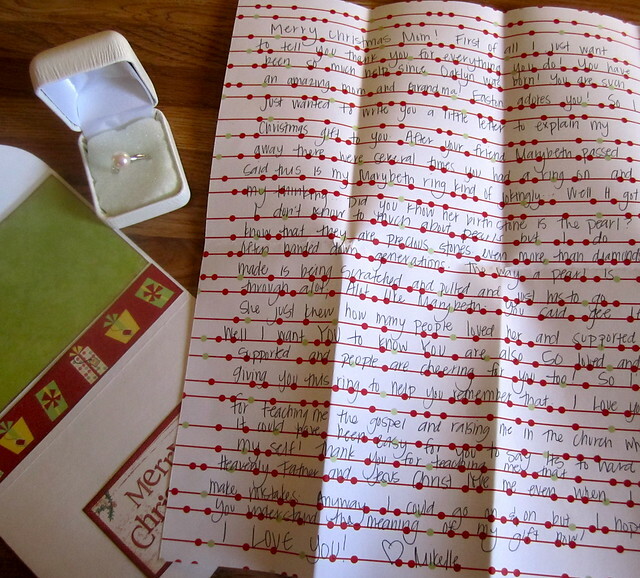 So, I just wanted to write you a little letter to explain my Christmas gift to you. After your friend MaryBeth passed away, there were several times you had a ring on and said, “This is my MaryBeth ring,” kind of jokingly . . . Well it got me thinking. Did you know her birthstone is the pearl? I don’t know too much about pearls but I do know that they are precious stones, even more than diamonds. They are often handed down for generations. The way a pearl is made is by being scratched and pulled and it just has to go through a lot. Well, I want YOU to know you are also SO loved and supported and people are cheering for you too! So, I’m giving you this pearl ring to help you remember that I love you for teaching me the gospel and raising me in the Çhurch when it could have been easy for you to say, “It’s too hard by myself!” Thank you for teaching me that Heavenly Father and Jesus Christ love me even when I make mistakes. Anyway, I could go on and on but I hope you understand the meaning of my gift now. I LOVE YOU! Yah, writing this and reading it again, I totally need a box of Puff’s Plus!!! Love, love, love this!!! Are you going to wear it? A lot, I mean. I know you can’t wear it at work, but the rest of the time you could, right?